(b) transport of thermal energy in the ground water and solid matrix of the aquifer. SUTRA may also be used to simulate simpler subsets of the above processes. 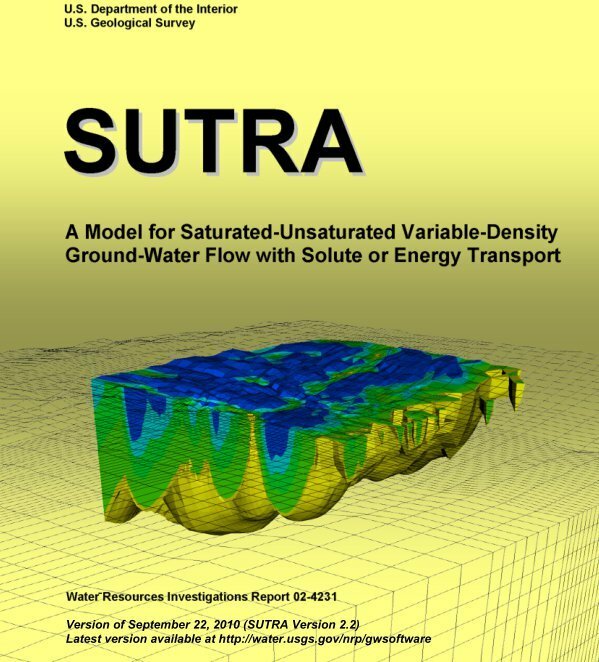 As the primary calculated result, SUTRA provides fluid pressures and either solute concentrations or temperatures, as they vary with time, everywhere in the simulated subsurface system. SUTRA flow simulation may be employed for two-dimensional (2D) areal, cross sectional and three-dimensional (3D) modeling of saturated ground-water flow systems, and for cross sectional and 3D modeling of unsaturated zone flow. Solute-transport simulation using SUTRA may be employed to model natural or man-induced chemical-species transport including processes of solute sorption, production, and decay. For example, it may be applied to analyze ground-water contaminant transport problems and aquifer restoration designs. 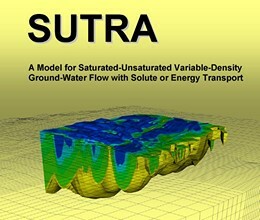 In addition, solute-transport simulation with SUTRA may be used for modeling of variable-density leachate movement, and for cross sectional modeling of saltwater intrusion in aquifers at near-well or regional scales, with either dispersed or relatively sharp transition zones between freshwater and saltwater. SUTRA energy-transport simulation may be employed to model thermal regimes in aquifers, subsurface heat conduction, aquifer thermal-energy storage systems, geothermal reservoirs, thermal pollution of aquifers, and natural hydrogeologic convection systems. Mesh construction, which is quite flexible for arbitrary geometries, employs quadrilateral finite elements in 2D Cartesian or radial-cylindrical coordinate systems, and hexahedral finite elements in 3D systems. Permeabilities may be anisotropic and may vary in both direction and magnitude throughout the system, as may most other aquifer and fluid properties. Boundary conditions, sources and sinks may be time dependent. A number of input data checks are made to verify the input data set. An option is available for storing intermediate results and restarting a simulation at the intermediate time. Output options include fluid velocities, fluid mass and solute mass or energy budgets, and time-varying observations at points in the system. Both the mathematical basis for SUTRA and the program structure are highly general, and are modularized to allow for straightforward addition of new methods or processes to the simulation. The FORTRAN-90 coding stresses clarity and modularity rather than efficiency, providing easy access for later modifications. * SUTRA download link provides freeware version of the software. The computer program (HST3D) described in this report simulates heat and solute transport in three-dimensional saturated ground-water flow systems. FEFLOW is a professional software package for modeling fluid flow and transport of dissolved constituents and/or heat transport processes in the subsurface. FEFLOW contains pre- and post processing functionality and an efficient simulation engine. No one has rated SUTRA yet. Be the first to rate this product.